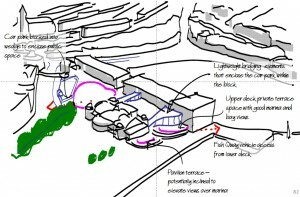 I recently completed a study into the potential urban design parameters for a new development on Torquay harbour-side in Devon. I was asked by local architects Kay Elliott to support their design team in discussions with the council, English Heritage and their client over the design. There was a need to formulate a robust and meaningful approach to the site development, one that will positively contribute to the local townscape and conservation area and adjacent listed winter gardens. All parties want the development to contribute to the restoration of the listed Pavilion, a Raj-inspired Edwardian hall and theatre whilst also providing a new residential and hotel development worthy of the prominent position. The task was to analyse the site and perceive a justifiable urban design approach that took into consideration the multiple site and viability constraints whilst setting some realistic and townscape-enhancing design parameters. 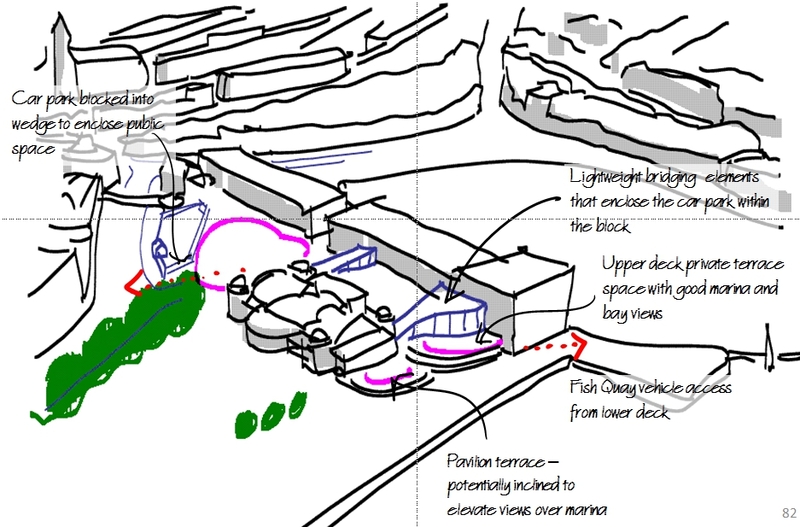 The study emerged with a series of design logic and massing diagrams as well as explanatory design concepts and codes for public space and movement proposals. The study is to be used as a basis for the design exploration set out in the design and access statement.